I enjoyed this post very much and I didn’t even know Mr. Torre’s name before reading this. I like baseball, just haven’t followed it over the past 20 years. Are you still going to tell us why God must be a Red Sox fan? I wanted to comment on your last post but it’s not letting me. Hm, have to say since I’ve ‘met’ you I am learning so much more about God and things I never knew before (Ipod aversions and fav baseball teams etc). You must be a very special man to have all this insight 😉 . Yeah, I’m a regular renaissance man. Nice post on Joe Torre too. I too am part of Red Sox Nation. Joe Torre we tip our hats to you and wish you the best with your future endveavors. What a fitting, and well written tribute to a true expert of the game. Never been a Yankee fan, nor Red Sox for that matter, but as a baseball fan I can appreciate the rivalry between the two. Joe seems an upright man and I second Bleed’s hat tipping. Thanks for your honesty, Smith. It really seemed only right. 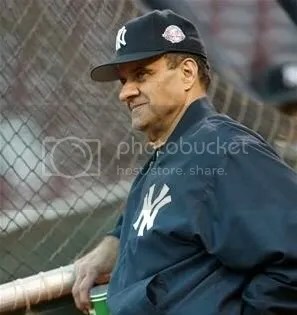 I may be a Red Sox fan, but I am also a baseball fan, and no true baseball fan can fail to appreciate what a great manager and fine man Joe Torre is.